Brought again this summer, this three-season shell is designed for the outdoor enthusiast and built for multiple active mountain sports. Fitz Roy is the most versatile jacket of the mountaineering collection and offers great value for the feature set. 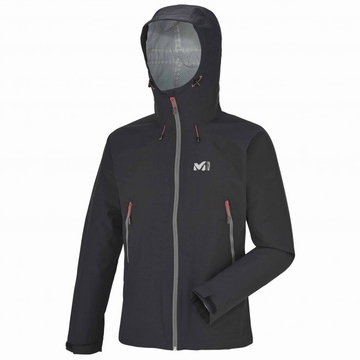 It is made of a soft and lightweight 2,5L DRYEDGE ALL WEATHER ripstop fabric construction for increased wear and tear strength. Highly packable design fits easily into your hiking or day pack and delivers great protection against the elements in all your mountains activities. With a waterproof and breathable membrane and complete seam sealing, its the perfect pick for your forest rambles or smaller outings. The Regular Fit prioritizes comfort and the ergonomic pattern design allows arms mobility and freedom of movement, preventing the sleeves from riding up. Underarm vents enhance air circulation and generous hand pockets allow your arms some rest. Pick your favorite colour of the combo and dont hesitate to be bold.